I am feeling extra comfortable now that I have the option to layer clothes thanks to the cooler weather. It allows me to create moer interesting and texturally exciting outfits using color and different fabrics with scarves, sweaters, and layers. Not to mention I love being all covered up and cozy warm in soft, warm fabrics. 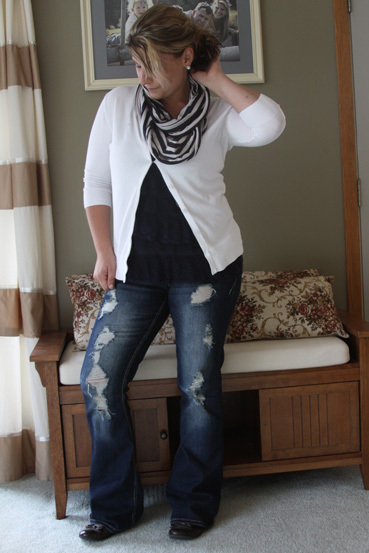 I’m finding lots of great ways to layer summer tanks with sweaters and scarves for looks that I love. Get the low down on why I am including What I Wore Wednesday posts here, but the main reason is to motivate myself to put in a little extra effort each and every day. 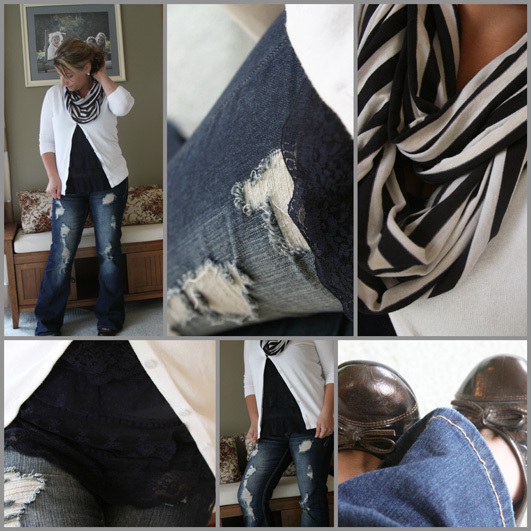 What I wore Wednesday is a way for Mom’s to share outfits and get inspired to get dressed even if they aren’t heading off to work each day. The Pleated Poppy has an amazing series where she shares what she wears each week to keep herself accountable for getting out of her pajamas everyday and I’m joining in the fun! 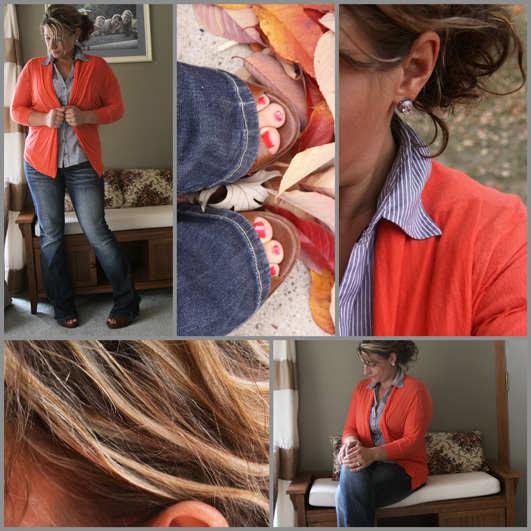 This weeks Pinterest inspired outfit was thanks to Lindsey over at the Pleated Poppy. 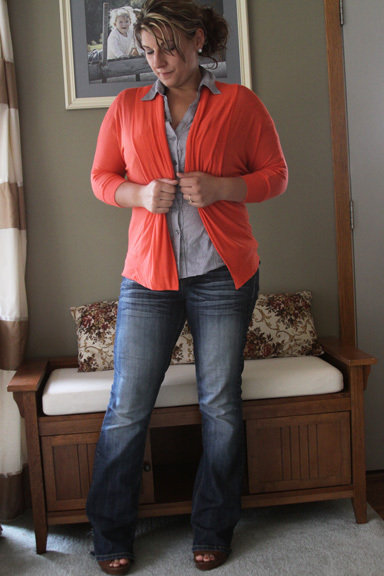 I loved her combination of bright orange and gray and couldn’t wait to try and put together something from my own closet with those colors. I don’t think I would have thought up the combination on my own – but I really love the colors together. Since skinny jeans and sweaters don’t fit my physique as well as they do hers, I opted for boot cut jeans and wedges instead, although i wish I could pull of her entire outfit. I loved this outfit! It was bright and colorful with lots of character thanks to the pinstriped Express shirt that I scored at Goodwill for just $4.00. It looks great with black pants and heels and that’s how I normally wear it, but this is a great way to make it a bit more casual and I’m excited to say this is a new favorite outfit. This was the perfect outfit to run to the grocery store, drop the little man of at school, get my oil changed in the old minivan, and drop clothes off at consignment. I ran around all day and had an unexpected visit with family latter that afternoon. It was one of those days that I was really grateful that I put some effort into my outfit earlier in the morning! The day was super busy and one thing lead to another, I was happy to be dressed and not in my jammies. Proof that this whole What I Wore Wednesday thing is helping! I love wearing jersey scarves this time of the year! They are comfortable and warm without being too hot. 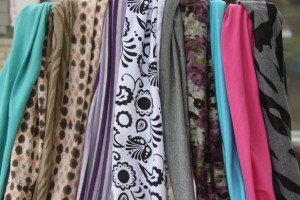 Last fall I made a bunch of scarves in all different colors and patters. If you want to make some yourself here is my easy infinity scarf tutorial! They take just a few minutes to make and are way less expensive to make than you can buy them in the stores. Plus you can get any color of patter that you like from your craft store. Here is the array of scarves that I own for myself – these make a great gift to make and give the ladies in your life too! Saturday: Family day! Running to town for home improvement stuff, lunch out, and getting the house ready for winter. Lots of work and playing outside. This is a very casual, comfortable, and “me” sort of outfit. I have a vest obsession, and ever since I had kids, it is my go to fall and early winter outerwear. I like the versatility of layering of vests over different things. What mom isn’t sweating buckets in the store with two kids and a load of groceries in a full jacket? Vests are a great option for me and they are perfect for working or playing with the kids outside. As you can tell, not a whole lot of effort in the hair department this week. 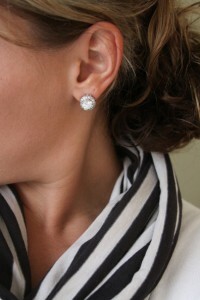 Mostly natural curls thrown up into a side “updo” or messy bun. Nothing too exciting to report, but at least I tried. Great outfits! The first on is my favorite. Love the color of your sweater. I love that second outfit…but you totally rocked the orange too! Great job!!! Love the first two outfits! I’d def. wear them! Dropping in from What I Wore Wednesday! 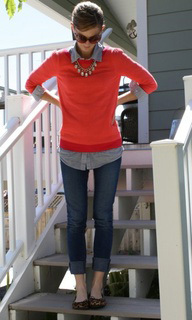 I liked your version of the pinterest outfit even better than the original! I really need to do some Goodwill shopping!